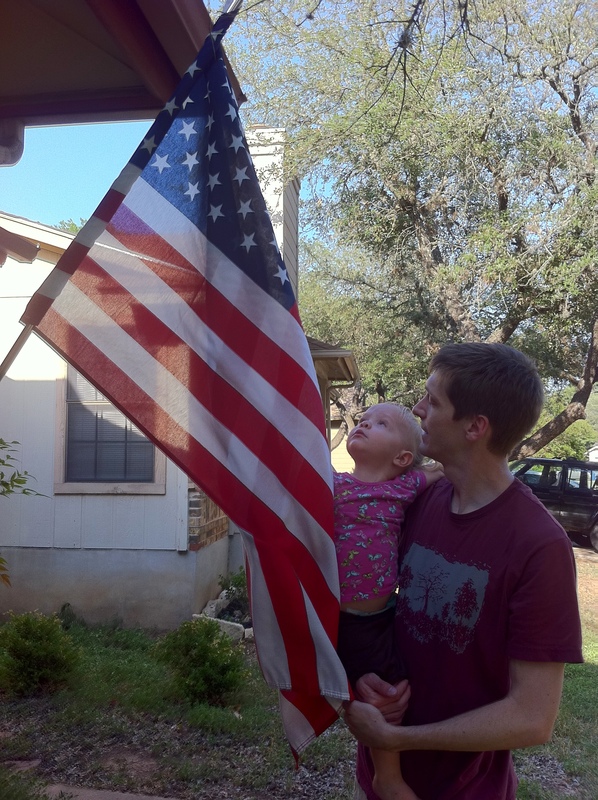 We appreciate our military and those who are serving our country. 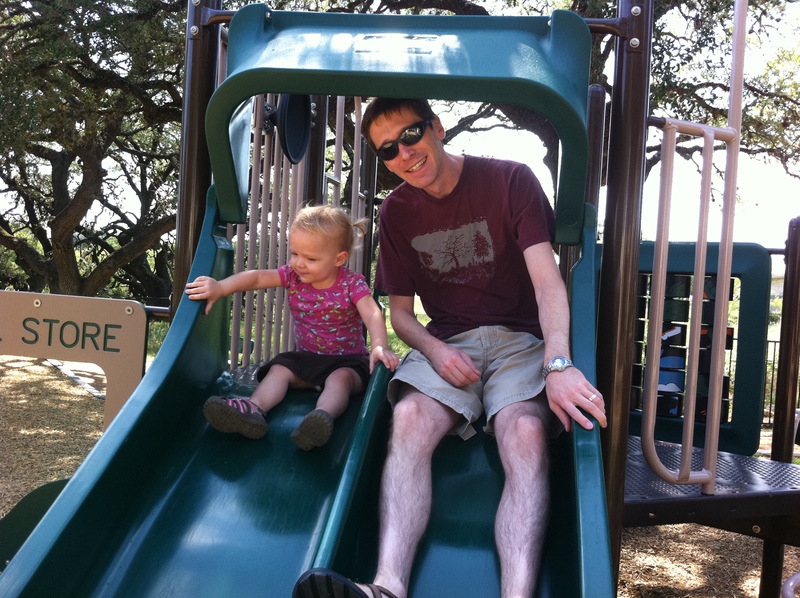 We enjoyed Brett’s day off and did some extra playing. There is a new playscape in Sunset Valley behind Doc’s Backyard. We figured the regular park would be full and this would be a good option to beat the crowds. We were right! 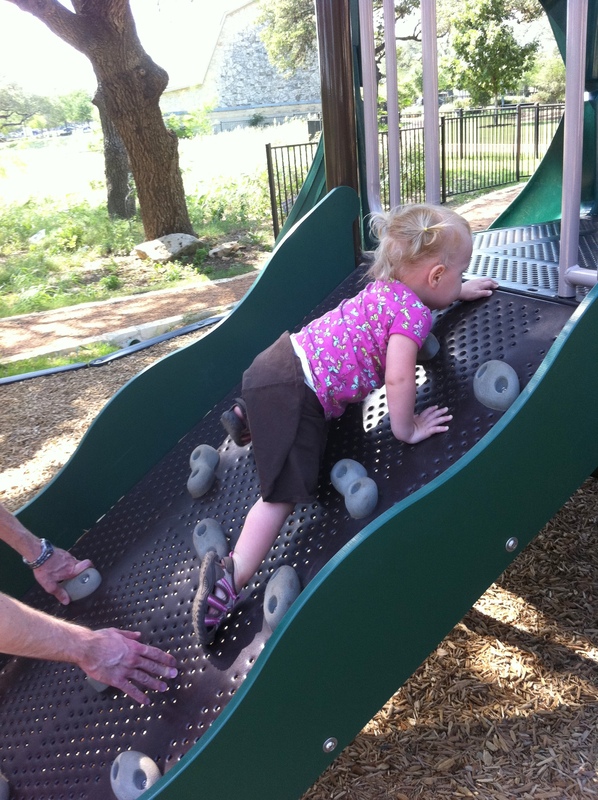 Sliding with Daddy and trying the climbing wall by herself. After all that playing, Hannah looked hot and kept asking to “eat, eat.” Being right next to Doc’s, it didn’t take us long to decide we needed to stop in and take part in their Happy Hour specials. 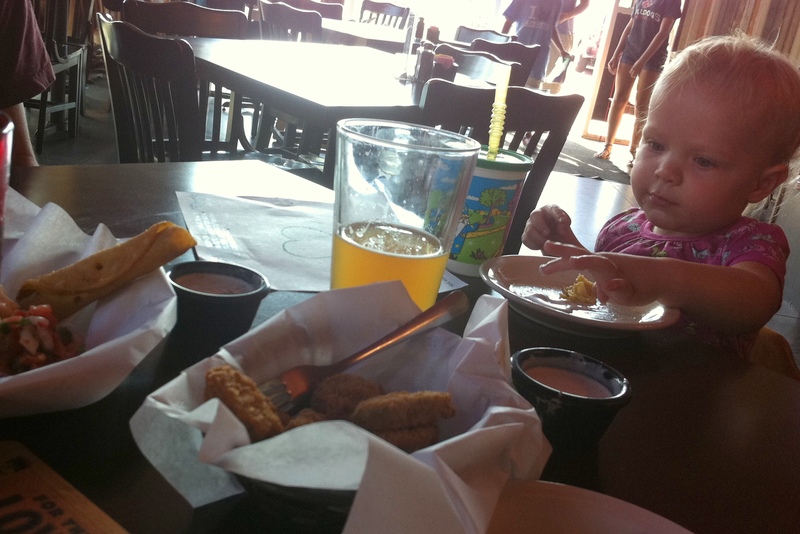 We split some fried pickles and flautas, and I found a Shiner Hefeweizen very refreshing. Hannah loves their cups with the big straws. We have also taught Hannah to dip lately, so here she enjoyed dipping her flautas (and fingers) in a bit of ranch dressing. The day ended on an unpleasant note as Hannah came down with a stomach bug, but her Daddy (who had previously emphatically professed his refusal to assist in such situations) didn’t leave her side for four hours. All she wanted to do was snuggle against him, and I think he even surprised himself by being totally okay with that. She seems to be doing better today. On to the next adventure. After years of watching the Food Network, I began to develop an awe of risotto. It was presented as a difficult dish, something that surely only professional chefs could pull off. After all, how else could they charge so much for it in restaurants? It must have expensive ingredients, and I knew it had many steps. Certainly not something I, a home cook, could pull off. My confidence was boosted when my culinarily fearless brother Michael made risotto during our annual sibling weekend this year. Not long after that, I produced my first risotto and was moderately impressed myself with the results. Maybe this risotto stuff wasn’t as hard as I had thought. However, the preparation is not toddler-friendly. The process takes my full attention for almost half an hour with constant stirring, so I can only make it on the weekends when Brett can keep an eye on Hannah while I cook. 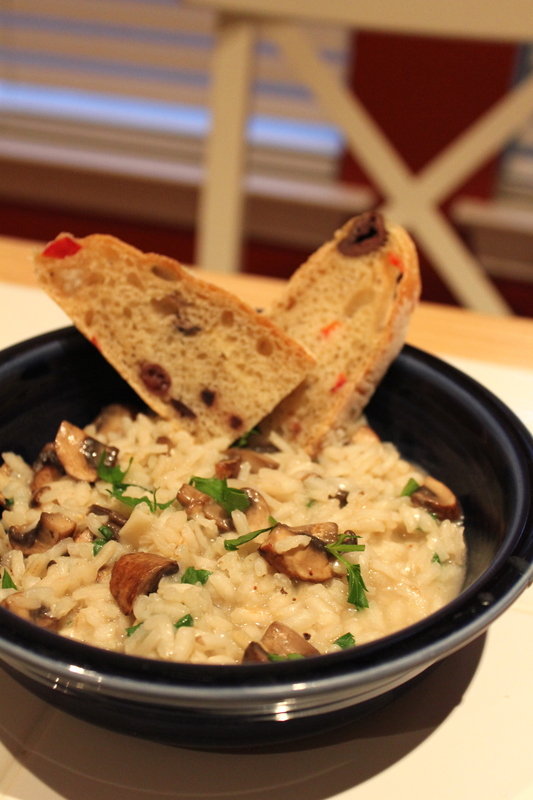 Tonight on the menu – crimini mushroom risotto. There are lots of risotto recipes out there, and any of them contain the basic steps of the process. This evening, I first sauteed some sliced crimini mushrooms. These are baby portobello mushrooms, and we really enjoy their texture and flavor. I bought them from the bulk mushrooms and saved almost $1 over the pre-packaged ones. After I toasted the rice (with some garlic), I added a half cup of dry white wine before starting the chicken stock additions. Then it was the normal basic process; at the end I added the mushrooms back in along with about half a cup of parmesan and some chopped parsley. So I started with two objections to trying risotto at home: difficulty of process and cost of ingredients. In reality, the process is not as much difficult as it is time-consuming, though that is really not bad. You just need some good instructions and some patience. When it comes to cost of ingredients, risotto is as expensive as you want it to be. The basic ingredients are arborio rice and chicken stock, everything else can be added based on creativity and budget. My mushroom risotto tonight was actually less expensive than the delicious olive bread from the farmers’ market that you see pictured. Filling and tasty, and makes us feel elegant. What did you have for dinner tonight? 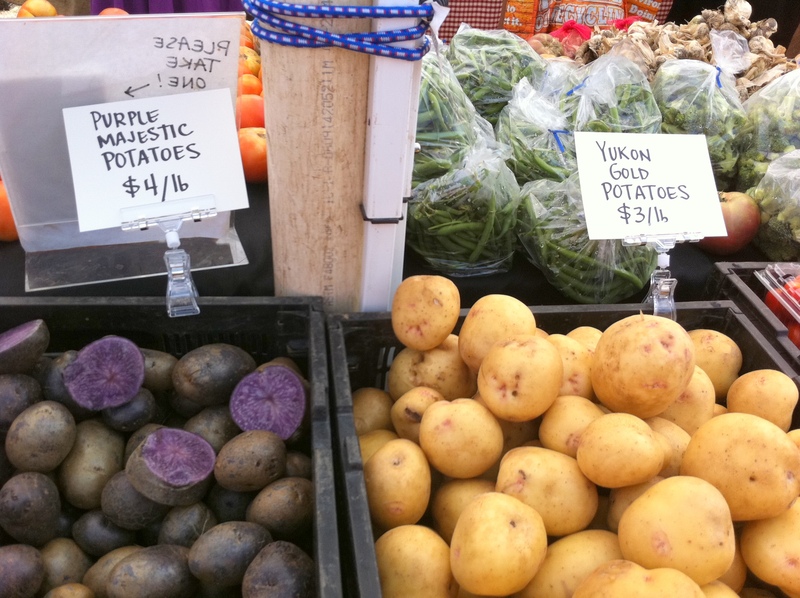 Purple and gold potatoes – I couldn’t get the red ones in the shot. Last week, my super-talented photographer friend Kay invited Hannah to be a part of a special shoot she was doing featuring fantastically fluffy tutus! These handmade tutus are by TamTam’s Tutus – if you’re not familiar with Etsy, you should be! Hannah had fun at the shoot with all the other girls and the fun props. She’s modeling the layered accessory look. 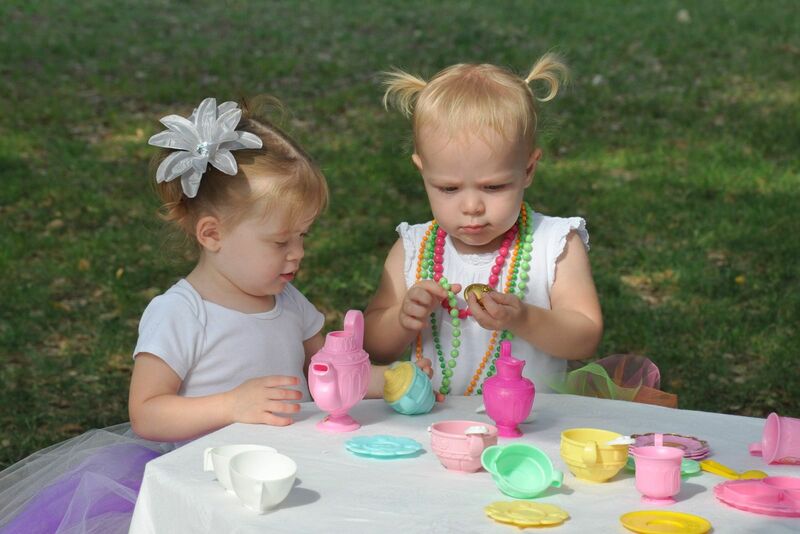 Then off to a tea party with Lilly. My mom had her camera along and took these pictures, and Kay posted some of the official ones on her blog (including a super cute one of Hannah on her tip-toes). Speaking of Kay’s blog, you should head over there today because she’s having a tutu giveaway! After the shoot, we bought the one Hannah had been modeling, and she loves to wear it around the house. Perfect for any girl! 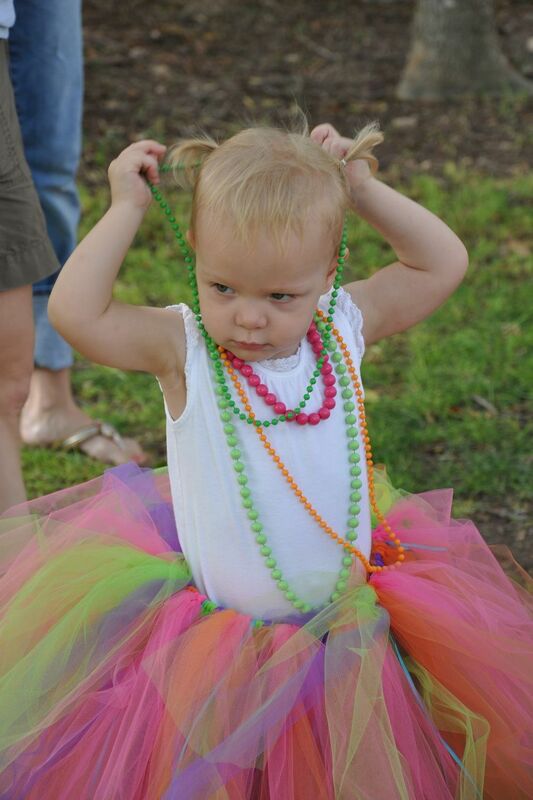 A fun day thanks to Kay Harmon Photography and TamTam’s Tutus. Brett has been a little under the weather lately, and he found out today he probably has a kidney stone. In an attempt to help him feel better, I changed dinner plans to include the classic comfort food of chicken noodle soup. With an Asian twist. I subscribe to several recipe email lists, and one that’s a little different is from Eat Better America. They take “normal” recipes and tweak them with healthy alternatives. A recipe from them that grabbed my eye one day was the Ginger Chicken Noodle Soup, and we enjoyed trying it last winter. As I was contemplating chicken soup for this evening, I immediately thought of this recipe. But no last-minute trips to the store for me – with some changes I was able to use things I already had on hand. 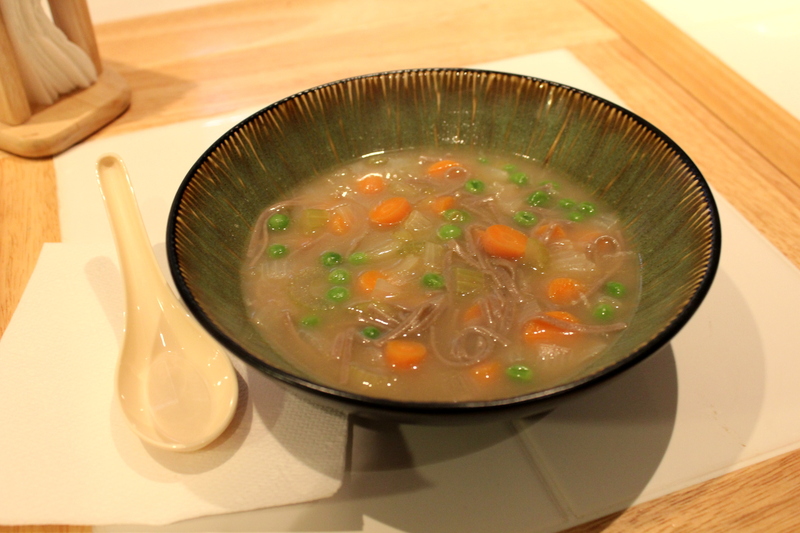 As called for in the recipe, I already had chicken stock, carrots, fresh ginger, soy sauce (tamari, actually), vinegar, peas, and buckwheat noodles. I did not have any chicken because I used up my frozen supply making another batch of chicken nuggets with Meghan yesterday. Luckily, I had more buckwheat noodles than the recipe called for, so I tripled the noodles to compensate for the missing chicken (though honestly we didn’t miss it). I also added some celery, garlic, and onions I had lying around. Brett said that just smelling it made him feel better. Someone else was enticed by the smell. She also tried to steal my carrots. 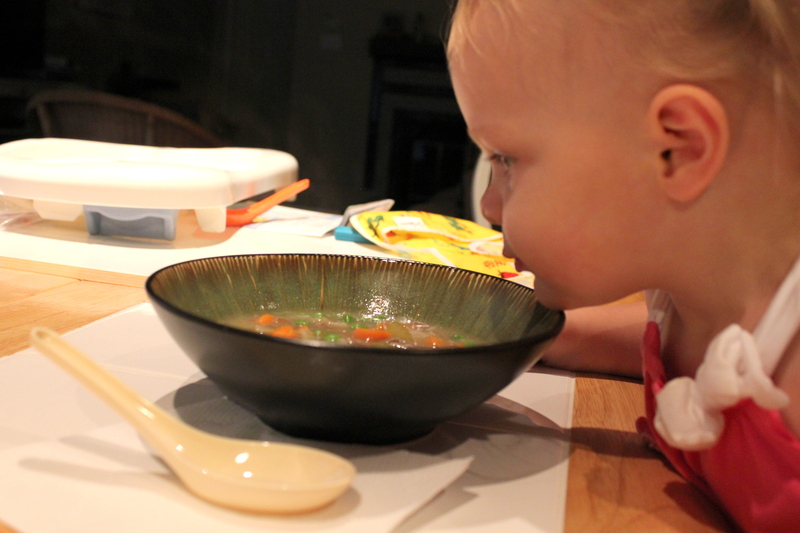 I made a bowl for her without broth so that she could eat it herself with less mess. She ate the carrots first, then the celery and noodles, leaving most of the peas. I was going for comfort food, and Brett declared it a success. Ginger is often recommended for upset stomachs, and this article even promotes buckwheat as a good for kidneys. And the way I made it, this recipe is also “safe” for those following a gluten-free diet: substituting tamari for soy sauce and using gluten-free buckwheat soba noodles, just check if your chicken stock is gluten-free. 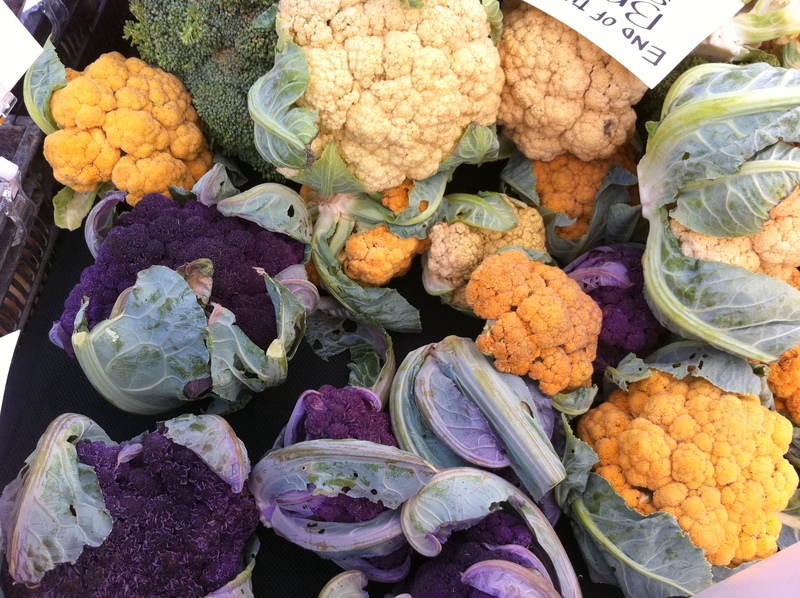 And it’s all healthful and tasty – score! A few months ago, a strip mall near us had quite a bit of turnover, and we were interested to see what new stores would open up. One was Man Pasand Grocery, an Indian food store. I got a tip that they have a small produce section with good prices, so this morning I went to check it out. According to a sign, they receive fresh produce on Tuesdays and Fridays, though since we got there right as it opened, they hadn’t received all their shipments for today. The prices were indeed lower than HEB – I picked up some onions for 49 cents/lb compared to HEB’s 78 cents/lb. Many of their produce offerings were either things that HEB doesn’t carry – such as ichiban eggplants – or things I didn’t even recognize (and deserve their own blog post). Definitely a niche market, and it’s the only South Asian supermarket in Southwest Austin. The highlight of my trip started as I neared the cash register. There was a foil-covered pan emitting enticing smells. 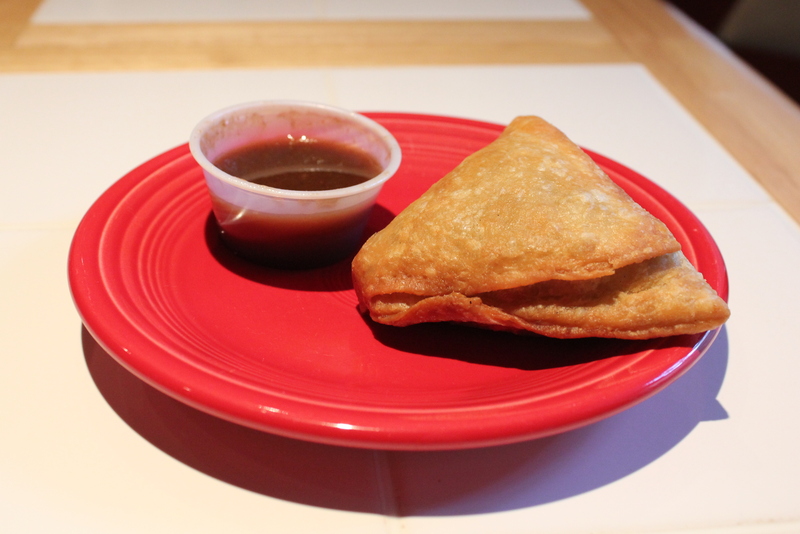 Homemade samosas for $1 each, couldn’t resist. I have to admit, one was immediately eaten when I got back in the car, but I was able to exercise self-control and save the other until lunch. The outside was perfectly crispy, flaky and chewy. 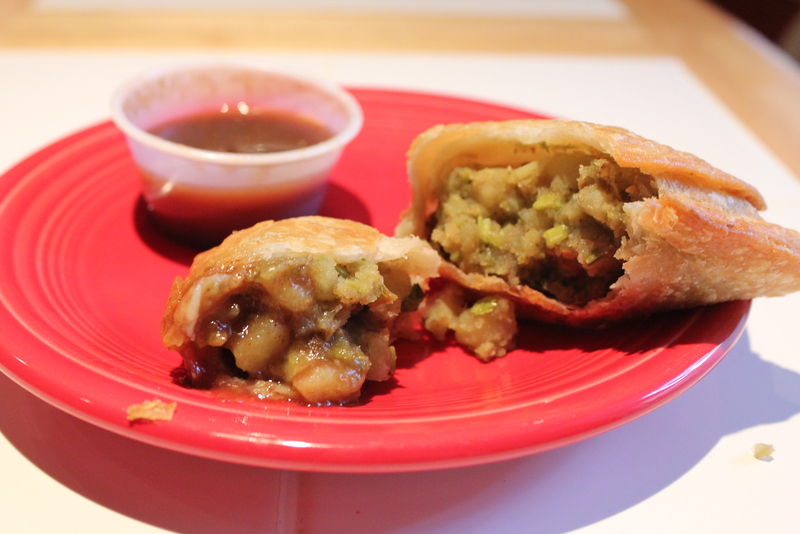 On the inside was a spicy vegetarian filling of potatoes, peas, curry, and herbs. The flavors matched perfectly with the sweet, tangy dipping sauce that was included. 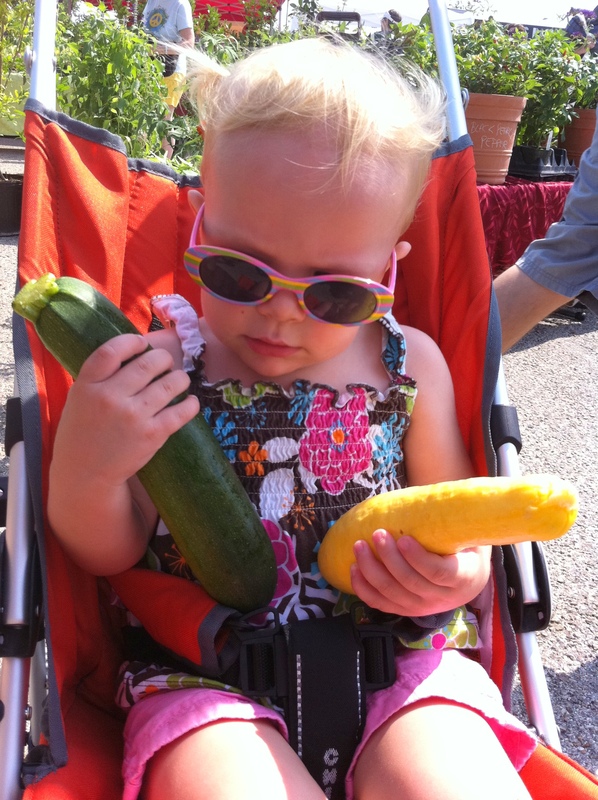 An unexpected prize from what was supposed to be a produce expedition – expect more to come. I don’t have a strong sweet tooth, but I can’t resist a cupcake. They’re too cute! 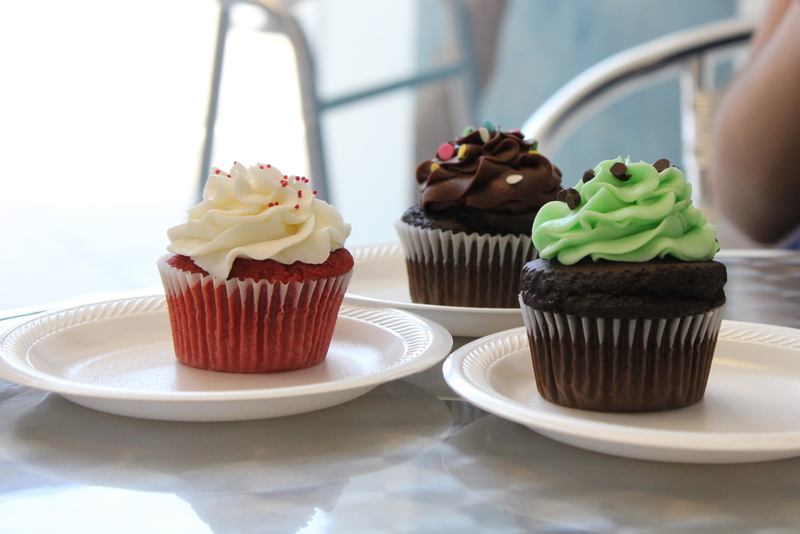 Our favorite cupcake spot – Lux Bakery and Cafe. We usually go for “real food,” they have a very diverse selection of sandwiches, but we enjoy their cupcakes as a special treat. We custom-ordered the adorable flower cupcakes from them for Hannah’s first birthday. Recently, we had to say goodbye to the Korean student that we had been “hosting” for the school year. Sally loves sweets and baked goods, so we took her to Lux for a little goodbye party. Our selection of Red Velvet, Chocolate and Chocolate Mint. Goodbyes are hard, but cupcakes make them a little sweet!